Celebrating the launch of its new menu and head chef, Malmaison Newcastle once again invited the regions bloggers in to sample their wares. Much of what is written here still applies: still the same awesome location, still a place to get some good cocktails in the swish bar overlooking the Quayside, and still the benchmark city-centre hotel – though they now have the Sandman Signature, and Hotel Indigo snapping at their heels. Definitely some proper foodies here – it’s all beef, beer, and butter as we chat about where’s good and not so good while looking over the brief new menu. It has a handful of starters and mains, as well as meats from the grill we sampled last time. Admitttedly nothing immediately jumps out as a must-choose, barring the steaks. We get some cocktails and nibbles (super-rich chicken liver parfait springs to mind) before some bread, butter and tapenade (£4). To start I go for Mal prawn cocktail, shrimp & jumbo prawn (£7.50) – always interesting to see what a place can do with the seventies classic. When it does arrive it is huge! Though maybe half of the bowl is ice, which helps keep the lettuce crisp. 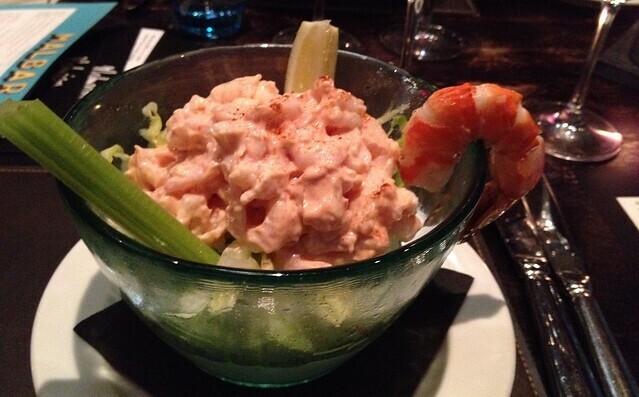 Prawns are soft and plentiful, if maybe the whole concept is a little too retro-facing. Others have, for example, Asian chicken skewers, or a scotch quail eggs & bacon salad. A good selection of wines, as usual – we get to try some great sauvignon blanc and a beautiful rioja – see Malmaison Newcastle Wine Tasting for a separate post about wines at Mal – but diners are dinifintely in safe hands here with regards to choosing wine. Resisting the urge to get steak again, the specials board beckons – roast lamb rump with onion puree & provencale vegetables (£17.50 – below). 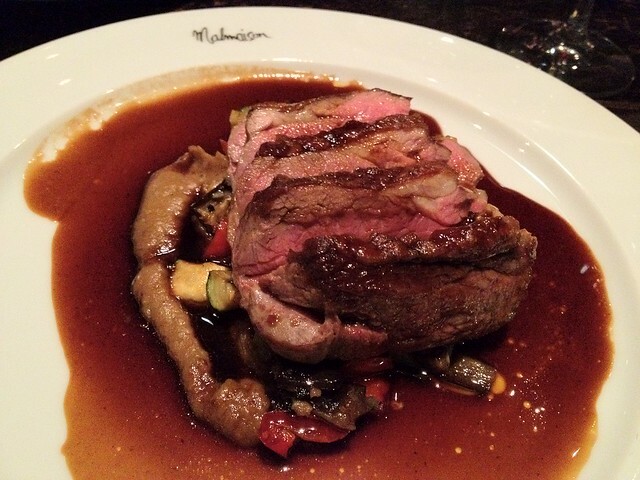 Asked and delivered medium-rare, the lamb is good, and the rich onion puree a comforting match. I chose lamb for comparison to a recent meal at the Hotel Indigo – and there is little to choose between the two – the MPW brand name unfortunately meaning very little these days, though their dish does come out a bit prettier than this. Many go for steak but our experience is somewhat soured as two of my fellow diners choose lobster – which I didn’t personally taste but it looks very, very dry, obviously overcooked, and is sent back. The kitchen profusely apologises, but if we have been invited here to impress, it’s pretty disappointing to be overcooking dishes to that degree – not least if paying £25/48 for lobster. Desserts are a strong point of the night. We share valrhona chocolate tart, The Mal sundae, and an iced fresh fruit plate. The tart is clearly a hit, especially amongst the ladies – rich, creamy, and it sits well with chantilly cream and honeycomb. Sundae is not something I’d typically choose as dessert, but this one is just about not too sweet, with decent ice cream, and I can easily mop up the leftovers that the calorie counters resist! Didn’t get any of the fruit plate – looks impressive though. 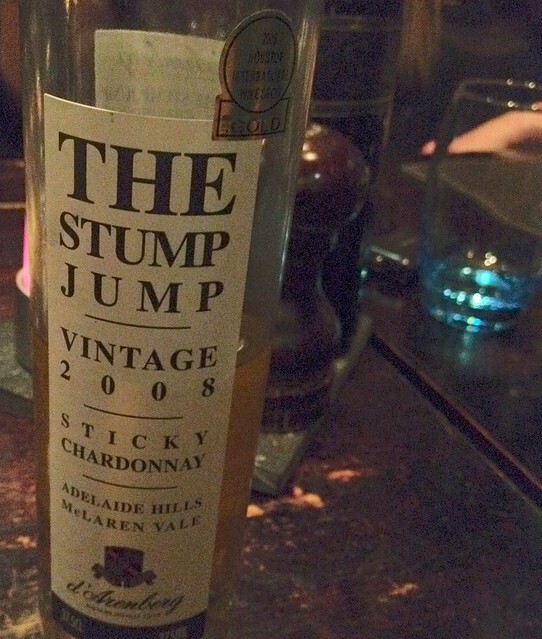 All £5.95, and we are treated to some Sticky Chardonnay (£7.50/125ml) – gorgeous. To round off the meal, Malmaison is finally launching an afternoon tea menu soon – and we are given a sneak preview – their “retro take” on classic the comes on vinyl records, and we get to try some of the cake selection; victoria sponge, lemon drizzle cake, and chocolate eclairs. Double desserts! The cakes are all fresh and properly done and wouldn’t be out of place on a good cake tier – definitely look forward to trying the whole tea later on this year when it launches. Good wine picks and a generally consistent standard but some errors creeping in from the Quayside stalwarts, hopefully this experience goes some way to keeping things tight in the kitchen. If Marco Pierre White @ Indigo Newcastle is coming out all guns blazing (review to follow), Mal might not have the city centre market to itself anymore. 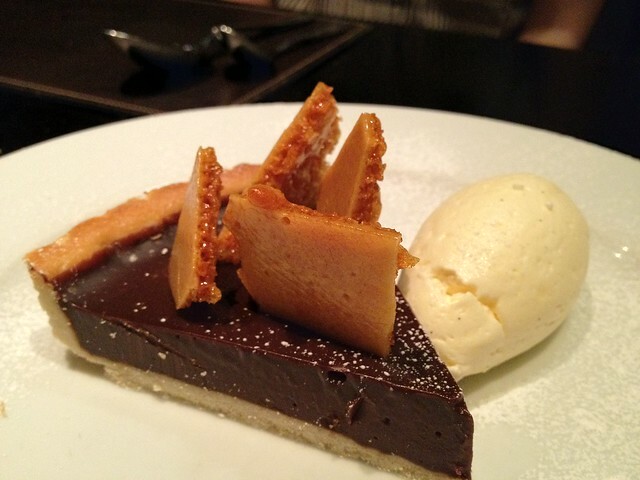 *Three courses a la carte around £25-35, comped for blogger’s dinner. Information correct 08 July 2012.